Coconut milk of 1 1/2 no. Garam Masala Powder 1/2 tsp. 1.Grate 1 1/2 coconuts and grind finely with 2 cups of hot water, squeeze out thick coconut milk and keep aside. 2.Add another 3 cups of hot water in the coconut and take out thin milk. 3.Roast 1/2 grated coconut till light brown, then fry the chilies, coriander seeds, jeera, methi & pepper. 4.Fry the 1/2 chopped onion till light brown in ghee. 5.Grind all these together with turmeric powder and garlic flakes with a little of thin coconut milk till very fine. 6.Remove the masala, mix it with the remaining thin coconut milk, the chopped chicken, 1 chopped onion, 1 tbsp. butter, salt and boil in a cooker for 5 minutes under pressure. 7.Remove and add thick coconut milk, lemon juice and bring to a boil, then simmer for a few minutes. 8.Keep 2 tbsps. ghee in a flat veseel on the fire, add the chopped onion and fry till brown. 9.Then add the garam masala powder and pour the curry into the seasoning and remove from the fire. 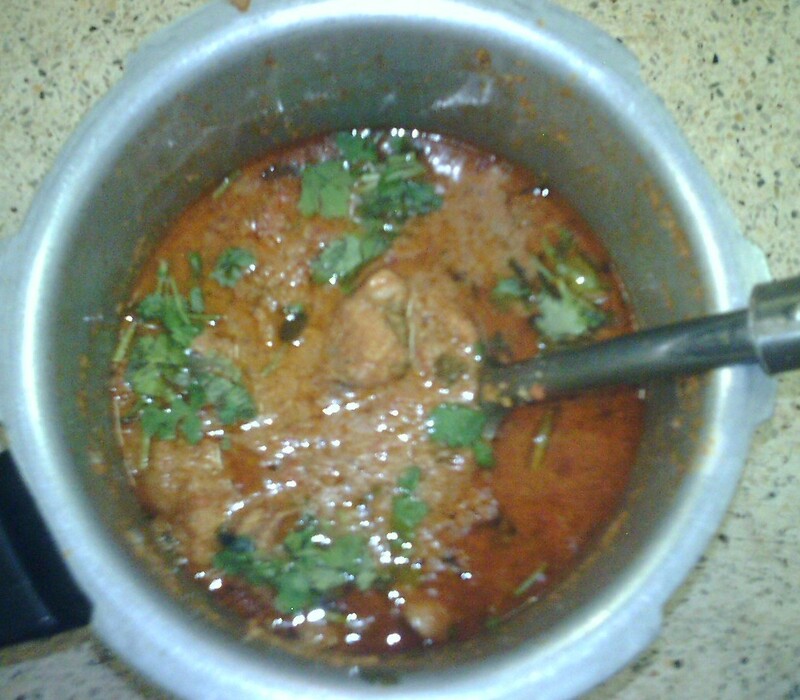 10.Serve hot with roti, idli, neer dosa etc.